B&B HomesBlogRTM Design and FeaturesHow to Utilize Professionals to Keep Your Project Within Budget. How to Utilize Professionals to Keep Your Project Within Budget. Little known fact: The start of your custom home project is not when you break ground for the first time. It’s all figured out on paper first. Be prepared to review, revise, and repeat to get everything within your budget and style. Make sure to allow enough time for planning and building to achieve your desired delivery date. So what are the steps you need to take to get your RTM project plan together? One big, and necessary, step is discussing what you hope your overall project will cost. At B&B, we have compiled an entire list of the expenses associated with building a home – reaching past the costs related to the RTM alone, including site prep, hookups and foundations. Discussing your budget with our on-site designer and estimator gives them the ability to design and quote your home project using materials and function that will fit within your overall budget while allowing enough room for other expenditures and features. To ensure that you do not encounter any surprises along the way that can suddenly hinder you from achieving your dream—or will require last minute split decisions—our estimator at B&B Homes is equipped to provide you with detailed quotes based on your budget parameters. From your RTM home costs to your on-site garage, foundation, hookups and deck, as well as any other required on-site elements that may come up. There are a couple steps involved in this process. First, designing your custom home. This involves everything from the style and materials chosen, to the layout and function of the home that fits your family’s lifestyle. All of these parts are taken into consideration and reviewed to make sure they are fitting your overall vision. The next step is estimating the cost of the design. In this phase you will be given quotes that include everything discussed during the design process. Once the first vision of your home is quoted, and you have a concrete idea of all the costs involved, it can be necessary to go back and revise some of the options chosen, or remove some features. Do not fear this step. Request changes or revisions to get the project to a stage you are comfortable with. This is a natural progression point in all major projects. More often than not, there is another material available, or another timeline to consider – like saving the decks or garage for a project the following year – that will make achieving your exact vision a reality (without depleting the quality of your home). The biggest feeling may be to give up. We get it, we’ve all been there. At B&B, we want to be there for you helping you through this stage. We understand this last step is full of very personal decisions, and requires thoughtful deliberation of answering the questions like “What do you most want to get out of your home?” and “What are the top 5 priorities?”. Once you feel you have those questions and thoughts answered, approach the drawing board again with our team of professionals. Ask all your questions, state your ideas, and display any concerns or fears you may have. B&B Homes wants to build you a home that we ourselves would live in. That requires perseverance, flexibility, and honesty from both sides. Believe us when we say all the hard work at this stage, makes the reward at the end even better. 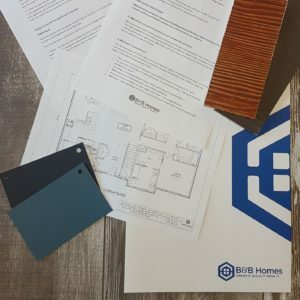 B&B Homes has earned the reputation for providing excellent quality RTM homes and prides itself on delivering superior customer service throughout the process. If you are ready to start planning a 2019 RTM project, reach out to us here for more information.